560 pp, 111 B/W photographs, 7 maps, 21 figures, tables & charts, plus appendix, notes, bibliography, and index. Paperback 6” x 9”, $39.95. BMC Publications is honored to have PACIFIC EXPRESS on the Marine Corps Commandant’s Professional Reading List for Logistics. These books are selected as most pertinent to critical thinking and professional development at each rank. Three books per year are required to fulfill annual reading criteria for all active duty and reserve Marines, officer and enlisted. 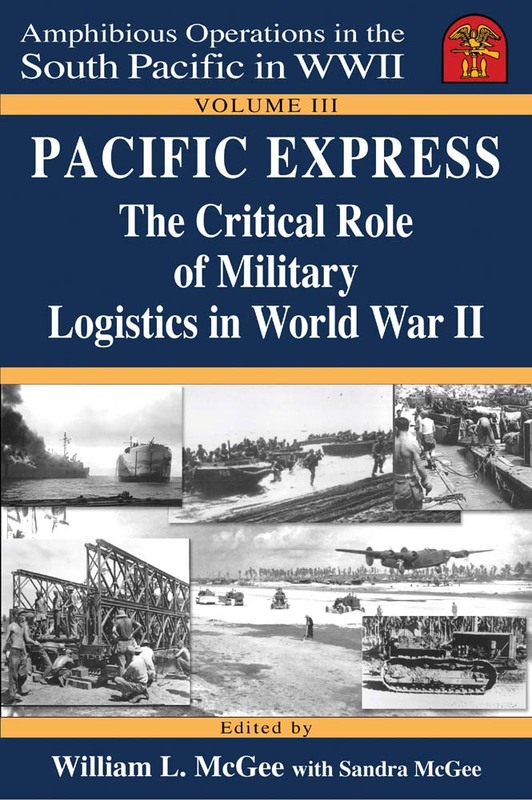 Under one cover, PACIFIC EXPRESS is an edited collection of the best works by noted military historians on the importance of military logistics in World War II. Consider this: In World War II, 16.1 million men and women served in the U.S. Armed Forces. For every individual who served in combat, ten individuals served in a support role. – U.S. Navy Seabees and U.S. Marine Corps Engineers – who built the Advance Bases. – U.S. Navy crews – who manned the amphibious force and Fleet’s floating mobile Service Squadrons throughout the vast reaches of the Pacific. – U.S. Army and civilian (civil service) Transportation Corps personnel – who operated most of the Army’s large and small vessels, but were seldom covered by the consumer-oriented media during WWII. – U.S. Coast Guardsmen – who manned hundreds of U.S. Army and Navy long-haul vessels and thousands of battle-loaded amphibious landing ships and craft. ■ A very polished and professional volume covering a major and relatively unheralded part of World War II … I’m sure the author will receive widespread acclaim for providing the quality and quantity of naval history in Pacific Express. ■ Bill McGee’s account of amphibious operations in the Pacific and of the supply effort needed to support all operations there is meticulously researched and told with the skill of a born storyteller. Pacific Express and the other volumes in the series will make a proud addition to anyone’s library. ■ The editors have woven historical facts with firsthand accounts to create a behind-the-scenes look at military logistics in World War II. ■ Besides providing statistics, Bill McGee provides a personal touch with interviews and references to persons who were actually there. ■ Bill McGee hits another home run with Pacific Express. My time served in the South Pacific in WWII springs to life as I hear the bow doors open and the ramp fall on Pacific soil … Reading this book brings back memories and tears to this eighty-plus year old LSM sailor. ■ With Pacific Express, Bill McGee secures his title of “Godfather of amphibious operations history.” This Volume III in his series anchors Volumes I and II as essential reading and reference for military history. ■ Although about WWII, much of what is written in Pacific Express applied when I served on the USS Helena (CA-75) during the Korean War and afterward. Bill McGee does a through job of explaining military logistics in ways we can understand. ■ Just finished reading Bill McGee’s third volume in his Amphibious Operations series and it certainly passes inspection.